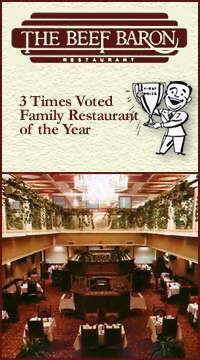 The Beef Baron Steakhouse is ideally located at the top of Clifton Hill in Niagara Falls, Canada. Enjoy our luxurious surroundings while you feast on our house specialties such as Prime Rib, Caesar Salad and Baked Alaska. Families are always welcome at The Beef Baron. Ask about our Special Prime Rib for only $14.95. You get it all at the Beef Baron Restaurant in the Falls. Choose one item under each of the headings below for your full course dinner. $30.95 per person. Vegetables of the Day, Fresh Bread & Butter.